Apartments are getting smaller, and life is getting busier day by day. Two things come out as a result of that. People do not prefer to buy furniture that is heavy and does not have portability, and they do not seem to be convinced that they have enough time for exercise. As a result, when it comes to exercise, they need something that is portable, foldable and connects their busy life and fitness together. And the best folding exercise bike comes into that scenario.Even though you own a big house, you would like to save some space without turning your bedroom or living room into a makeshift gym. And a foldable exercise bike does just that for you. After you’re done exercising, you can fold the bike and tuck it into a corner. Even though you are a busy office person, you can keep one in your office to utilize your lunch time. If you’re willing to buy folding bikes with desk stations, spending slightly above that range should cover you nicely.We have gone through an enormous list of best foldable exercise bike, and after careful assessments and comparison, we picked the top 5 for our readers. This is one of the most popular folding exercise bikes on the market. Why? It’s lightweight but can carry a great amount of load. It is comfortable to sit but can be folded into a compact size to store it neatly. The bike is sturdy and does not shake during exercise. If you live in a small space or want your exercise equipment to take small space, this one is perfect for you. For the surprisingly low price, the bike is a bargain. Let’s take a look at the features of the Exerpeutic folding magnetic upright bike. Frame : People from 5’3” to 6’1” can sit on the bike easily. The frame has a heavy duty design, can take up to 300 lbs. of weight. The design made it quite easy to get on or get off the bike, providing more comfort during the workout. It has a dimension of 31”L x 19”W x 46”H inch and weighs 42.8 pounds. Sitting Arrangements : The seat is quite comfortable as it has a larger cushion, so the size of the people who can sit on it is not limited. The seat is adjustable, can be upped and down quickly and without any hassle. Resistance : It has an amazing 8 level resistance system, making it enough challenging for even experienced users. The magnetic tension control system allows the user to adjust the resistance level for an easier to more difficult workout. For beginners, it’s suggested to start from early levels and increase the levels gradually. Display And Console : What remarkable about the Exerpeutic folding bike is, it has a large LCD monitor to track your training data. The screen shows the number of calories you have burned during your workout. It has a dual hand pulse tracker, and heart rate is displayed on the monitor. Not only that, you can watch your speed, resistance level and your exercise time on the display. Storage : The bike can be folded and tucked into the corner of your room quite easily. When folded, the size comes down to half of the assembled size. It has transportation wheel so moving it after your exercise is never a headache. Leg Stabilizers : It has a set of leg stabilizers, which adds extra security. The leg stabilizers help the bike to stand still when it’s being used. For the price, the bike has a sturdy, user-friendly design. It’s a bargain if you consider the features and your gym expenses. The pulse tracker shows quite accurate data. The seat is adjustable, so people of different sizes ranging from 5’3” to 6’1” can easily use the bike. This bike takes up very small space of your room. 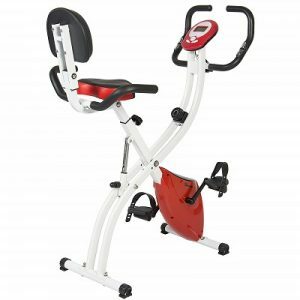 The flywheel and the V-drive provide the user a smooth and noiseless exercise. Watch your favorite shows on television while exercising. If your size is under 5’1”, the seat and the bike might seem bigger to you. According to some users, the pedals are mounted slightly forward. It took them some time to be habituated on the design. Just because something is cheap, it doesn’t necessarily act cheap! The Exerpeutic 400XL Folding Recumbent Bike is a perfect example of that. This is a semi- recumbent bike. Which means it is a mix of an upright and a recumbent bike. Your legs are in front of you and down at an angle. A vast amount of positive reviews about the bike says the users liked the structure and it provided them with benefits. The Exerpeutic 400XL is known as the best folding recumbent exercise bike on the market. Frame : This is a super lightweight bike, only 43 pounds, which might leave you thinking, will it be able to carry your loads? Believe me, it can, and up to 300 lbs. The bike stays still during the exercise even for taller users. The frame is made of steel tubing frame and very durable. According to users, they have used it for more than 3 years without any problem. The dimension is 33L x 19W x 46H inches. It can facilitate users from 5’2” to 6’2” easily. Sitting Arrangements : The seat is slightly inclined, which acts as a support for the back. While the seat padding is comfortable for many, some users said otherwise. What matters is the exercise time. If you intend to continue the exercise for more than an hour, you should use some extra padding or take intervals during exercise sessions. For a shorter period than that, the seat works just fine. The seat also has support bars which will keep your hands free for reading a book or use your tablets. Resistance : The Exerpeutic recumbent bike has a precision balanced flywheel and an 8 level magnetic resistance system. You can set the resistance level by turning a knob just below the console. While level one means almost no resistance, level 8 provides quite a test for the user. Display And Console : The display shows the speed, resistance level, calories burned and the heart rate when the hands are on the hand pulse sensors. You can either choose to see just one reading or go through all of them at an interval of every 6 seconds. Anyway, while the console has large number readings, the display is not backlit. Storage : The bike can be folded into half of its assembled size and can be stored under your bed or in your cabinets. If you own a small apartment or office space, you can use it during your free time and get it out of your way when the exercise is done. The bike is silent so not likely to bother anyone. There are rollers attached to the bike to help you move it anywhere. Handlebars : The handlebars on the wither size are gripped and quite comfortable. The handles don’t cause ache to the users even after long use. The handlebars have pulse sensor attached to them to monitor the heart rate. Can be adjusted quickly, suitable for family use. The bike is a good choice on its price as it is durable. The folding ability gives you flexibility to use it anywhere, your house or your office. It has a smooth resistance transition system from easy to tough. The bike is quiet and steady. The bike doesn’t tip or shakes during workouts. As the seat is slightly inclined and comes with back support, the bike doesn’t engage the back and abdomen as much as an upright bike. The console is not backlit, so it might be difficult to see the readings in poor light. Many of us don’t have excess time to exercise. Although finding time for exercise is necessary, quite often this recommendation doesn’t motivate the workaholics. Thus, demand for an exercise bike which can also act as a workstation is increasing. As a response to that, the exerpeutic company came up with their multi-functional bike. 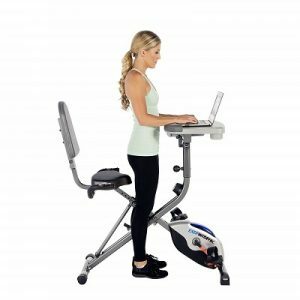 The Exerpeutic WORKFIT 1000 Desk Station Folding Semi-Recumbent Exercise Bike comes with a large adjustable desktop, a comfortable seat any many other features. All of them comes with a surprisingly low price. What can more anyone want from an exercise bike? Frame : The Exerpeutic WORKFIT 1000 has a steel tubing frame which is painted with corrosion resistant paint. The frame is sturdy and can carry up to 300 lbs. of loads. The frame has a folding design and a weight of 64.7 lbs. The bike’s assembled dimension is 45.3L x 25W x 51.3H inches. The bike comes with 2 cup holders and 1 storage drawer. This rust-proof folding bike is an office person’s conduit between work and fitness. The Desk : The frame has a folding design. The main attraction of this bike, the desk part has a dimension of 16L x 24W inch. The desk is spacious enough to keep your laptop on it. The desk can be adjusted to 3 angles. 0°, 16° and 33°. The height is also adjustable between 41″ and 45”. Last but not least, the desktop can also be moved forward or backward. The desktop is made of heavy duty PVC material and can carry up to 44 lbs. of weight and has two cup holders on it. It has support in the base to prevent your laptop or tablet from falling. Sitting Arrangements : The seat is quite comfortable with 7 cm thick cushion, which is not quite common in the other bikes on the market. The seat has a comfortable backrest which is also padded. The seat can be adjusted to different heights and accommodate users from 5’3” to 6’1” comfortably. The seat has air cells which ensure coziness of the user when sitting on it. Resistance : The bike is semi-recumbent and features a manual magnetic resistance system. Which means, the bike doesn’t need to be attached to a power source to deliver resistance. The bike has 8 resistance levels. The first levels are almost no challenge, while the final levels can even break a sweat of a regular. The transmission system of this bike is belt powered. This is a noiseless bike. The pedals are made of nylon materials and come with adjustable straps. Display And Console : On the middle of the base of the desktop, there is a display to show you various statistics. The console shows speed; calories burned, distance and time. The display also shows heart pulse rate quite accurately acquired from the pulse rate sensors on the handlebars. The console has two switches, which does all the works. You can either fix to one value in which you are interested most, or you can travel through all readings mentioned above one after one. Storage : The folded dimension of this bike is 21.3″L x 25.5″W. The bike can be tucked nicely in the corner of your home or office after use. The bike has wheels on its rear base so it can be moved easily. The design is a revolution for busy people or office workers. The bike features a comfortable thick padded 2-way seat with backrest. The desktop can be set to various angles, heights, and distances from the user. Unlike many other bikes, this bike has two cup holders and a storage drawer. The anti-corrosion double coat painting will keep the frame rust-free for years to come. The LCD panel is relatively small. Anyway, one might accept that knowing the bike had to provide space for the desktop. If the manufacturers come up with a charging dock for tablet or laptop, that would make it a true champion. One of the most versatile exercise bikes on the market. The thing that places it above other bikes in this price range is the sitting position. It allows the user to sit in three different positions from upright to a semi-recumbent position, providing the user a comfortable experience. The bike is beautiful and what makes it more desired is the features that come along it. Frame : The bike is relatively new in the world of exercise bikes, but already popular due to its sturdy design. The frame is made of steel. It allows user up to 220 lbs. The bike is steady and does not shake during exercises. The bike doesn’t have a lever, which means it might rock on an uneven floor. Using floor mats can solve the problem. The dimension is 26”L x 21”W x 50” H.
Customer feedbacks on this bike have been positive so far. The bike is constructed to serve the user for a long time. Sitting Arrangements : The Best Choice Products Folding Adjustable Magnetic Upright Exercise Bike has a comfortable sitting arrangement with a backrest. The seat can be adjusted into different heights. Just loosen the adjustment knob and take the seat to your desired level, insert the push pin and tighten up. The backrest comes slightly inclined which is preferred by most people. The seat has a comfortable cushion. Still, it may take time for some people to get habituated in this bike type sitting arrangement. The bike should be comfortable for people from 5’3” to 6’1”. Resistance : The bike has an 8 level resistance system. The resistance level is controlled by a knob, placed in the halfway of the bike so that the user can access it from any sitting position. The speed goes up gradually, so the user doesn’t feel any disturbing bump when changing the levels. Like other bikes of this price, the resistance level goes from almost zero to moderate. The pedals have straps attached to them so the user can place his or her legs firmly. Display And Console : The console is of basic type. It shows the speed; calories burned, distance, odometer and time. It also shows heart rate when the hands are placed at the heart rate sensors on the handle. The LCD shows one reading at a time; you can set the mode to go around the measures at a 6 seconds interval. The screen is not backlit. Storage : The bike folds up to a smaller size. It can be stored behind a door or in a closet. It might not be compact enough to keep under standard size bed. To fold, you have to remove the holding pin and slide the stabilizer bars together. They look like a pair of scissors when closed up together. Then you need to insert the pin back there. The weight of this bike is slightly over 40 lbs. The bike does not have any transport wheels. It has an amazing feature of 3 different exercise positions. The bike is quiet and doesn’t shake on a flat surface. Can be used by various people because of the seat adjustment facility. Beautiful revitalizing look and low price. Can be assembled and folded quickly. Does not have any pre-set workout program. The bike doesn’t have any transportation wheels. The bike doesn’t have levelers. Although that should not be any problem on flat surfaces. Do people care about how their bikes look like? Well, apparently they do, or the Sunny Health & Fitness Folding Recumbent Bike wouldn’t be so popular. The bike is a semi-recumbent bike which comes with attractive pink color. The bike takes over the responsibility of your fitness without taking much space of your room. This fashionable bike comes with a low price tag, that’s what make it the choice of all types of people. Frame : The product weighs only 36.8 pounds and can carry up to 220 lbs. Despite the weight, the bike stays strong without any trembling. The frame is made of steel, and it brings a sense of security in the first look. The dimension is 32L X 19.5W x 46H. Users said the bike had gone more than one year without any problem and they expect to get much more from it. It should be functional for people from 5’3” to 6’2” easily. Sitting Arrangements : The seat is 9” wide and 11” long. The seat is adjustable to various heights. The backrest provides a comfortable support for the back. However, the seat might not feel that much comfortable if you continue your exercise for long periods. In that case, you can purchase padded seat covers adding a small price to the bike. The bike comes with a pair of handlebars so that you can use it like upright bikes, or you can use support bars attached to the seat to turn it into a recumbent bike. Either way, the bike offers you great flexibility. Resistance : You can control the resistance using the knob just under the handlebar. The knob has one to eight level marked. You can choose from easy (level 1) to moderate resistance (level 8) easily, just turn the knob clockwise to increase the level and anticlockwise to decrease. The bike can give you a good sweat, but if you are a pro athlete, you might go for something more intense. The foot pedals have strap system to give you more control while exercising. Display And Console : The LCD provides a good reading of your speed; calories burned, distance and the time. The console needs two AA batteries to run. It starts automatically when you start paddling or turn the mode switch on. It turns off after 4 minutes of inactivity. The display isn’t backlit so seeing the readings in a poor light might be a problem. Storage : The bike turns into leaner size when folded, and easy to store. The folding process is easy, you remove the holding pin at the center of the bike and slide the feet together and insert the pin again to hold it again. The Sunny Folding Recumbent Bicycle has rollers in the end caps of the front stabilizer so that you can move it easily. The bike is a treat for the eyes, and silent. A great gift for your loved ones. The bike has a dual sitting type. You can go for upright or recumbent as per your comfort level. The bike is cheap and affordable. You can adjust the height of the seat so 2 or more people can use it. Has rollers to help the user when moving it. People under 5’3” might feel uncomfortable in reaching the pedals. The resistance level isn’t that intense for a pro, while it’s perfectly suitable for regular people. There are a lot of folding stationary bike on the market. When it comes to choosing the best folding exercise bike, the answer is not straight forward always. Each of them has their specialty. Knowing their features, comparing them and find out the best out of them is a mammoth task. And on your part, it’s a time-consuming matter, the time you wanted to save at the first place. When you are buying a folding exercise bike, keeping the following matters in your mind will save your time and help to get a clear winner for your circumstances. We can see three types of exercise bikes on the market. Upright, Recumbent and Spinner exercise bike. An upright bike is just like a regular bike. The difference is that it doesn’t move like the regular ones. An upright bike has you bent over the handlebar. When it offers better cardio than the other types, users have to put pressure on their joints when pedaling. A recumbent offers spinal posture, relieving pressure off the joint. The user sits comfortably in a slightly reclined position. Although recumbent bikes are less effective as far as cardio is concerned, they are friendlier for older people or people with ankle or joint pain. The spinner bikes are usually found in the gym. They are like an upright bike; only their handlebars are lower. So the user has to bend over, and this way an intense workout is ensured. There is another popular type named Semi-recumbent which is a mix of the upright and recumbent bike. Their pedals are in front like a recumbent bike, and down to some angle like an upright bike. They have handlebars like upright bikes and slightly inclined seat like the recumbent bikes. Before buying an exercise bike, check for the resistance levels. Bikes come with different resistance levels. Some bikes offer moderate resistance at the highest tension level; they are more than enough to break a sweat for regular people. If you’re a pro or want a tougher challenge, go for an intense bike. Height and weight limits are often overlooked by the buyer. As a result, they find out later that the bike is unable to support their physique. The height and weight limits aren’t something written in stone, but they give a rough idea about what the height and weight of the user should be. If your height is lower than the recommended, reaching for pedals might be tough. If you’re taller, you will not be able to stretch your legs fully, causing joint pain. Same goes for the weight limit, is you are over the recommended weight limit, there is a chance that the bike will be damaged after some use. That’s the main reason we’re buying it, right? Some bikes do an excellent job when it comes to folding. They get down to almost half size or smaller when folded. Others, don’t do much in the case of folding. So look for how easily the bike folds and how much it folds.Another thing is portability. Obviously, there are heavy bikes and lightweight bikes, but the weight doesn’t matter much is the bikes have wheels at their end which makes it easy to move them. Some bikes come with extra padded seats which are comfortable enough for you. No matter how long you exercise, your back won’t get sore. Some bikes come with basic seats which are comfortable for a shorter time, but if you wish to continue exercising for more than 1 hour, you sit bones might get tender. The solution is adding an extra foam or gel seat cover, or simply a folded towel underneath. The sellers wouldn’t mind selling their expensive bikes, which ranges from a couple of hundreds to a thousand or more. You, on the other hands, might have some expenditure restraint. Obviously, expensive bikes have more features and resistance levels, but for the regular people, basic bikes are more than enough. They have all the functions for a basic workout. If you do not want to break the bank, you can buy bikes within 100-200 dollars range. Your body is your best friend. Like every best friend, when it turns against you and wishes to harm you, it will be your worst enemy. Your body screams to you to pay it some attention, but when it goes rogue, the results are terrifying. You might be busy, or you may not have the environment around you to go for a run. But if you’re willing to maintain your fitness, you can start that right from your home, or office. The best folding exercise bikes provide the functionality and flexibility you need. They track your speed, calories burned and heart rate. So instead of going out for a random workout in the weekends, you can choose to make it organized and regular. We have chosen the top 5 from a vast list of folding exercise bikes. We weighed their features, gone through their reviews and took their price into consideration. They have the capability and portability to blend into your life easily and help you to start your fitness journey right away. The return on investment you’ll get from them regarding durability and fitness is tremendous. Happy Exercising! !